The 72-year-old president’s demanding pace on the midterm trail contrasts with long blocks of unstructured ‘executive time’ at the White House. President Donald Trump returned to the White House from a rally just before midnight Thursday. He was on the road again by midafternoon Friday to West Virginia and Indiana, where he was expected to whip up his supporters with back-to-back combative, high-energy speeches that draw crowds of people who want to witness the Trump show. It’s all part of an 11-day rally sprint that Trump has signed himself up for ahead of Tuesday’s midterm elections — the tail end of a travel schedule that has been a slog by design. 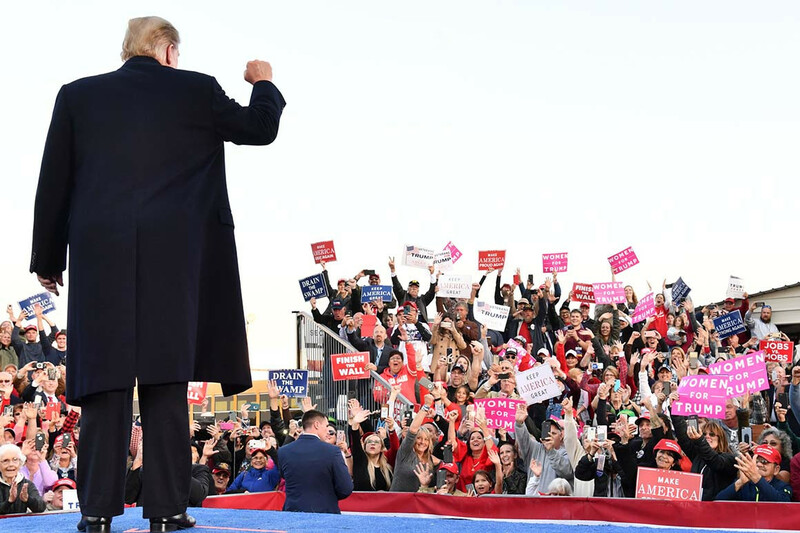 By Election Day, Trump will have headlined 53 Make America Great Again rallies across 23 states, as well as 70 fundraising events since he took office in 2017. He has staged 30 rallies since Labor Day. Trump hasn’t exactly built a reputation as a workaholic in his day job: At the White House, his schedule is often filled with large blocks of “executive time” — unstructured and unsupervised hours he spends in the Oval Office or the residence, watching television and tweeting (but also often also taking meetings with people that his staff wants to hide from his schedule). And he has long believed that the image of energy and endurance is a political asset. In 2016, he successfully branded one of his early GOP rivals, Jeb Bush, as “low energy.” Trump also often mocked Hillary Clinton for lacking “the stamina” to be president. Trump’s criticisms of his opponents — like accusing the media of propagating lies when his speeches and public statements are often rife with inaccuracies — are often a mirror of his own deficiencies. But when it comes to sheer, physical stamina that does not appear to be the case. Trump’s busy campaign schedule is striking for a 72-year-old man who doesn’t believe in exercise, and whose diet has long relied heavily on well-done steaks, McDonald’s quarter pounders and Diet Coke by the bucket. “The guy’s a machine,” said Corey Lewandowski, Trump’s former campaign manager, who traveled extensively with him during the 2016 presidential race. Lewandowski insisted that he’s never even seen Trump close his eyes on the plane between stops. Trump’s breakneck campaign schedule isn’t just about boosting Republican candidates in the midterms, although he has been in great demand for candidates across most of the country. It’s also about competition with the men who have held his office before him, and part of a pass-the-blame strategy if Democrats make big gains on Election Day. In some ways, the midterm campaign offers Trump a window to conduct the presidency that his family members, at least, always thought would be his preferred mode: “Making America Great Again” out on the road, energizing his followers, while outsourcing the grunt work of foreign and domestic policy to Cabinet officials and aides. That model has not exactly come to pass — even if Trump has shown less gusto in complex national security briefings than he has before large, cheering crowds. But people close to Trump insist that his physical stamina is and always will be one of his greatest assets.